Name of husband: Walter Barrett, 26 years old. Floyd Barrett, age 1, born 28 July 1906. Father is still living, mother died Oct 10, 1893. Father recently enrolled with the Cherokee Tribe. All other questions are unanswered or answered as unknown. Josephine Barrett, #25889, of Cohutta, GA. Born 1879, Hillsboro, GA. Married to Elbert Barrett, age 33. Children: Charlie Barrett, born 1895; Beulah Barrett, born 1898; Jean Barrett, born 1900; Rachel Barrett, born 1901; Shedrick Barrett, born 1903; Columbus Barrett, born 1904. Parents: Stephen Phillips (born NC) and Mary Allen Phillips (born GA). Siblings: Jim Phillips; Squire Phillips; Randolph Phillips; Sarah Wilburn; Josephine Boyd. Signed 17 June 1907. William M Beshears, lives Whitfield County GA, Post Office Varnell. Born July 26, 1849, Cherokee Co NC. Claim through my mother Elizabeth Roper, daughter of Sarah Roper and Isaac Roper. I am married to Cordelia Beshears, who is 47 years old. Parents: James Beshears and Elizabeth Beshears, maiden name Elizabeth Roper. James born Pendleton Dist SC. Elizabeth was bron Cherokee Co NC. They were living Cherokee Co NC in 1851. Father died April 4, 1900; mother died Sept 11, 1900. Grandparents on fathers side unknown. Grandparents on Mothers side: Isaac Roper and Sarah Roper, born in NC, living in GA in 1851. Henrietta Boyd, and children, of Cohutta. #25887, rejected. Daughter of # 18500. Remarks: Henrietta Boyd, Sarah Wilburn and Josie F Barrett. Henrietta Boyd, born 1 June 1854, Hillsboro GA. Married to Johu Boyd. Parents: Stephen Phillips (born NC) and Mary Allen Phillips (born Georgia). In 1851 they lived at Hillsboro GA. Father is living. Mother died 17 Apr 1906. Father enrolled very recently. My siblings: Jim Phillips (Chattanooga TN); Squire Phillips (Pine Log GA); Randolph Phillips (Diwane IL); Sarah Wilburn, born 1867, (of Cohutta); Josephine Barrett (of Cohutta). Cant give history, my father is so old, he has lost his mind. Signed 17 June 1907. Arie Caldwell; Indian name: Helton; residence: Carbondale, Whitfield County GA.
23 years old, born Oct 8, 1883, Gilmer County GA.
Married to John Caldwell, 24 years old, of Cherokee tribe. In 1851 they were living in Gilmore county. Mother is deceased. Siblings of applicant: Sula, James, Cora, Budie, Ethel, another. Statement by Uriah H Summey, He was born in Lincoln County NC, July 4, 1827 and moved to Murray County when quite young. He was well acquainted with John H Helton and Easter Helton, who formerly lived near Spring Place, Murray County, GA. They were partly Cherokee and very much resembled Indians, although not know what percent. He does know that Joe and Jim Vann were uncles of said Helton, making him very mixed. He remembers the treaties with the Indians in 1835-6 and 1848 and that he remembers that Helton was living amongst the Indians when the treaties were made. That he resided in Murray County in 1835 when Mary Ann Helton was born to the said Heltons and in 1850 she became his wife (Mary Ann Helton Summey). His wife has died. Date of statement 7 July 1909. Sallie Elizabeth Coe, Cohutta, GA. #28195. Born 1874, Murray Co GA. Married to David A Coe, of Cherokee tribe. Children: Harley F Coe, born 1899; Virgil G Coe, born 1902; Ardie M Coe, born 1903. Father Allen Coe (born TN) died 1893, mother Elizabeth Phillips (born Murray Co GA), died 1895. Siblings: James Coe (born about 1869); America Coe; William Coe (lives Blue Springs TN); Jackson Coe (has been dead 5 years); John Coe (lives Blue Springs TN); Charley Coe (lives Blue Springs TN); Louis Coe (lives Cleveland TN). Grandparents: Helton and Elizabeth Helton of Cherokee Co GA. Names of their children: Sally Helton, Martin Helton, James Helton, Mary Helton. I am the widowed wife of David Coe, and this claim is for his minor children. Joseph Phillips and his wife Elizabeth Helton Phillips moved to the Cherokee Nation. Mary M Cole; residence Cohutta, GA. Born Whitfield County GA, June 5, 1869. Claim through Mother, Martha A Corley, nee Martha A Whittemore. I am married to Arlando O Cole, age 34 years. My parents: Pickens Corley, no Indian name and Martha A Corley, nee Whittemore. Indian name was Frow Hawk, maiden name was Martha A Frowhawk. Father born Edgefield County SC; mother born Cherokee Co GA. In 1851 they lived in Bartow Co GA. Father is living and mother died July 17, 1879. Tillman Corley, born Sept 1873; died Jan 16, 1879. Names of my grandparents: Spencer Whittemore and Melissa Whittemore. They lived near Praters Mill in Whitfield County in 1851. Claimant is daughter of Mary A Corley, who was the daughter of Lucinda Jordan, who was daughter of Frawhark, full blood Cherokee Indian, who was carried away from this County. I am 1/8 Cherokee. Maude Josaphine Helton Deadwyler, lives Athens GA. Born July 4, 1887, Evensville TN. Husband A Paul Deadwyler, age 23. No children. Parents: Jas Henry Helton and Ola Clyde Helton, maiden name Ola Clyde Davidson. They were born near Tunnel Hill, Whitfield County, GA. Both parents living. Father recently filed application #12942. Grandparents on mothers side: William Calvin Davidson and Mary Josaphine Davidson from near Tunnel Hill GA.
Ola Clyde Davidson, now Mrs. Jas Henry Helton, Cedartown GA.
My mothers mother Polly Foster, wife of Absolom Foster. Born Apr 1865, Upson Co GA; married Gertrud Smith Fambro, 31. Children: Annie Lee ae 14, born Oct 1893; Frankie, age 12; Johnnie, age 10; Emma, age 7; Willie, age 5. Parents: Martin Fambro born SC and Francis Collier Fambro, born Upson Co GA. Still living, and lived in Upson Co GA in 1851. Siblings: Charlie Fambro, living in Chicago IL; James Fambro, died; David Fambro, lived in Pittsburg PA; Nettie Fambro Jackson, lived Dalton GA; Mary Fambro Smith, Dalton GA; Frank Fambro, Chicago IL; Allen Fambro, Pittsburg PA; Hattie Fambro Johnson, Pittsburg PA; Sallie Fambro, dead; Arthur Fambro, Dalton GA; Ellis Fambro, Dalton GA; David Fambro, Dalton. Grandmother on mothers side was Mary Calhoun. He thinks they lived in Upson Co, does not know where they lived in 1851, nor their children. Parents: Ervin McWing Helton (born Spring Place, Murray Co GA) and Lugenia Pierce(born Dalton). Siblings: James William Helton (born 1869, lives Floyd Springs, Floyd Co GA); Charley Randolph Helton (born 1871, lives Alabama City AL); Lillian Bell Helton (born 1875, aged 32, lives Whitney AL); Richard Edward Helton (age 22, born 1885, lives Whitney, AL); Jessie Sexton Helton (age 19, born 1888, lives Rocky Face); Mattie Lugenia Helton (age 16, born 1891, lives Rocky Face). Grandparents: James Helton, (born Hall Co GA) and Terese Sexton (born McMinn Co TN). They were living near Catoosa Springs, Catoosa Co GA in 1851. Grandparents children: Ervin McWing (living Rocky Face); Mary Jane (living unknown); Sarah Ann Mullinax (living Tryon GA_; Mariah Clark (living AL); Berl Smallwood (living Chattanooga TN); Walter Helton (living La Fayette GA); Henry Helton (living Cedartown GA). Ervin McEwing Helton, residence Rocky Face, application #12462. Born 9 Oct 1849, Murray Co GA.
Married to Lujenia C Hilton, ae 53. Father James Hilton (born Hall Co GA); mother Terrasia Sexton (born McMinn Co TN). They lived at or near Tuill Creek, Gilmer Co GA in 1851. Father died Nov 25, 1863; mother died Sept 12, 1882. Mare Jane Anderson, born 1 Sept 1851, moved west-no tidings from her in 16 years. Walker Russell Hilton, born 17 July 1860. James Henry Hilton, born 14 Nov 1862. Grandparents: Jehi Helton (born Hall Co GA) and Easter Helton (born Hall Co GA) and Russell Sexton (born unknown) and Ruth Sexton (born SC). They resided at or near Tuill Creek, Gilmer Co GA.
Mary Ann Swiney? Died a number of years ago, date not known. Henry Hilton, went west a number of years ago, no tidings for a long time. Erwin M Helton, Rocky Face, on behalf of his underage children. Application 33161. Guardian of 2 children. Rejected, minors full sister to 33355, rejected for same reasons. Born 1849, Murray Co GA. Wife Luginia Cornelia Helton, 54 years old. James William Helton, 37, born 1869. Charley Rodolph Helton, 36, born 1871. Lillian Bell, 32, born 1875. Thomas Henry Helton, 29, born 1878. Richard Edword Helton, 22, born 1885. Mattie Lugenia, 16, born 1891. Brown Kinion, # 25885, of Cohutta Georgia, rejected. Nephew of #7649. Born 1886, Whitfield County, GA. Married to Mollie Kenon, age 16. No children. Father: Michael Kenon. Mother: Ophelia Wadkins Kenon. Both born in Whitfield County GA. Father is still living. Mother died 10 Oct 1893. My father recently made application. Siblings of Brown Kinion or Kenon: Bindie Cooley (lives Cohutta), born 23 Aug 1879; Leila Westfield (lives Cohutta), born 20 June 1881; Arbell Barnett (lives Cohutta), born 1883; Lewis Kenon (lives Chattanooga TN), born 1885; Lillie Kenon, (lives Cohutta), born 1891; Ella Davis (lives Chattanooga), born 1894. Signed 18 June 1907. Parents: Mr Lafayett J Mullins (claim #7613) and Mrs Francis Mulanax Mullins. Both from SC, resided in Cherokee Co GA 1851. Sister Margrate P Sloan of Wahacha TN. Augustus B Nichols; Age 40; living Vinita, Indian Territory. 1/16 Cherokee; applying for himself, his wife and children. Father’s name is William T Nichols (deceased); his fathers mother was Catherine (deceased). Wife is Alice (a non-citizen), maiden name McGee. Married Alice McGee in Whitfield County GA, 22 Dec 1881. Wife’s father and mother are non-citizens. Children of Augustus and Alice: Lucy M, age 17; Thomas W, age 14; Claude D, age 11; Clifford C, age 8; Maudie I, age 6. A certificate is supplied showing A.B. Nichols is a Cherokee citizen, dated 11 Sept 1883, signed by Thomas Tehee, Commissioner. He has been living continuously in the Cherokee Nation since 1882. Names of himself, wife and children are found on the census of 1896. He was born and raised in Georgia and lived there until 10 or 12 days after his marriage, then moved to the Indian Nation. Statement of Lewis B Hudson: Has known Gus Nichols since they were boys. That Augustus and Alice had been living as husband and wife since 1892 when Lewis came to the Indian Territory. Alice now citizen by intermarriage. Stephen Phillip, lives Cohutta GA. #18500. Stephen Phillips of Cohutta, born Salisbury NC, 1807. I claim through my Indian grandmother who raised me. Wife: Mary Phillips, is dead, aged 85 years. Father; Long Tow Phillips and Josephine Phillips, both born NC, both dead before 1851. No siblings. My mother and father died when I was a child, both were Cherokee Indians. I was raised by my grandmother. Signed 15 Mar 1907. I was stolen as a child with my grandmother by a man by the name of Richmond and he sold me to a man by the name of Bill Phillips. My mother and grandmother were full blood Cherokee. I served as a slave of white people. I claim through my mother. I am married and my wife is 67 years old. Parents names: father is blank, mother is Martha Pitner, Indian and maiden name is Martha Hunter. Father was born Gilmer County GA, mother was born Habersham Co GA. Mother lived a mile from Cohutta in 1851. Siblings: Tilda Pitner, Harry Pitner, Aelie Pitner, Dave Pitner, Tom Pitner, Owen Pitner. Grandparents on mothers side: Rachel Pitner and Poea Hunter, both born in Habersham Co GA. In 1851 they lived 3 miles from Cohutta. A later letter says his parents were living in Sevier County in 1834-5 and were in Varnell Dist, Whitfield County in 1882. Grandparents were slaves to white people. Has 4 children, has been in the Cherokee Nation for hardly 2 years. Claims 1/8 Cherokee. Provided a authenticated certificate of admission to Cherokee citizenship, dated Oct 14, 1887. Was living in GA before going to Indian Territory, because family wasn’t well enough. All children but 1 from that time are dead. Applying now for Robert L, (born 14 Oct 1887) who is aged 13; Viola L who is 9; Lucy (born May 24, 1894) who is 6; Luke (born July 10, 1896) who is 4. Mother of the children: Vashty, a white woman who died 1989. Ancestor: Lewis Rawlston appeared on the rolls of 1835. Robert D Ralston and son Robert L Ralston are on the strip payment rolls of 1894. 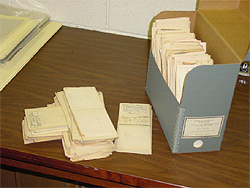 There are many pages in this file, as Robert D Ralston was given Cherokee citizenship while he was in Dalton, then it was taken away as he needed to be in Indian Territory when the citizenship was given. Took them a couple of years to get it straightened out. Hariet E M Wade, Cohutta, GA (#16152), and 3 children. rejected. First cousin once removed of #13870, claims thru same source. Harriet Effie Melinda Wade, lives in Bradley County TN, address is Cohutta GA. Born 18 Jan 1848, Franklin Co GA. I claim through my mother who in 1851 was living in Franklin Co GA. Her name was Harriet E Roberts, then her name was Harriet E Peyton. Her mother was full Cherokee, and her father was 3/4 Cherokee Indian. I am married to H S Wade, born March 10, 1848. My father: James Roberts, born Franklin Co GA. My mother: Harriet E Peyton, born Elbert Co GA. Father died about 1864, mother died about 1897, both in Franklin Co GA. My brothers and sisters: William Roberts, Jesse Roberts, Moses Roberts, Enoch Roberts, Howell Roberts (all in War from 1861-1864), Buck Roberts (died in childhood), Sissy (died in childhood), Frank Roberts (lives in Banks Co GA), John (lives in Hall Co GA), Ann (Miles, lives in Murray County GA), Mary (Tankesley, lives in Hall County, GA), James Roberts (lives in Bessemer County, AL). Do not know Indian names on fathers side. On mothers side: her grandfather was Joseph Briant, called "Frosty" Briant, and Nancy Briant, both Cherokee Indian. I am not able to say if they were living in 1851, if they were it was in North East Georgia. My mothers siblings: William Peyton, Elbert Peyton, Archie Peyton (they all lived in Elbert Co GA), Emeline (Crook, lived in Elbert Co GA), Nancy Peyton and Harriet E Peyton (mother of applicant). About 1894 this applicant made application for land right in Cherokee Nation and was approved. Signed 29 Jan 1907. Children of applicant: Daniel Monroe, born 27 July 1872; Mary M (Densmore), born 25 Dec 1878; Cora Venie, born 19 Feb 1881; Sylvania (Smithey), born 11 May 1883; Manuel S, born 10 Apr 1886; Thos Washington, born 27 Feb 1891; Kinney Malinda, born 22 Nov 1894. I made an error in the name of my grandfather. His name was Neddie Briant, and was called by the whites "Frosty" Briant. Frank Elrod of Murray Co GA knew him. Sarah Wilburn, of Cohutta #25888, rejected. Daughter of #18500. Sarah Wilburn, born 1867, Hillsboro GA. Married to Chas H Wilburn, aged 52. Siblings: J L, born 1883; H B, born 1885; Clarke, born 1886; Sam born 1892. Father: Stephen Phillips, born NC, dead. Mother: Mary Allen Phillips, born GA, died 17 Apr 1906. In 1851 they lived in Hillsboro GA. Siblings: Jim Phillips (lives Chattanooga TN; Squire Phillips (lives Pine Log, GA), Randolph Phillips (lives Duncane ILL), Henrietta Boyd (lives Cohutta) and Josephine Barrett (lives Cohutta). My father is very old and I cannot get the desired information from him. Note: Father died Feb 13, 1908.